NextWill Marijuana Help My Insomnia? You spend one night in a sleep lab. There, you’re wired up with electrodes, and every 30 minutes you’re instructed to let yourself fall asleep. But you’re never allowed to sleep more than a few minutes. A lab tech comes in to wake you up and sees to it that you’re awake for the rest of the period. Then another 30-minute sleep trial begins. The results? 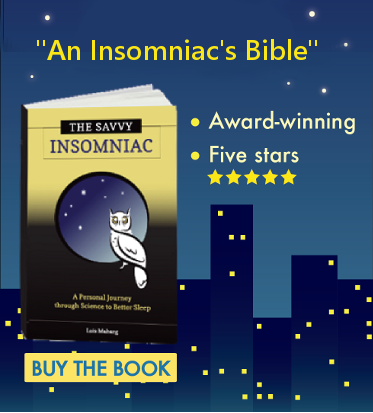 The few clinical trials conducted show that insomnia subjects who have undergone ISR are able to get to sleep faster and sleep longer. These gains have lasted up to 6 months. But ISR is currently unavailable in the US. The treatment is expensive and not covered by insurance. Plus the idea of 24 hours of sleep deprivation can be off-putting. So why mention it? Michael Schwartz, a registered polysomnographic technologist, has developed an iPhone app that delivers sleep training in what he believes is a more palatable way. Called SleepQ, this inexpensive app is based on the principles of ISR and designed to give users repeated exposure to what it feels like to fall asleep at home. Schwartz’s many years of work in hospital-based sleep centers have convinced him that the problem for many insomnia sufferers is not that we can’t fall asleep, but that we lose touch with what falling asleep feels like and confidence in our ability to do it. Practice with SleepQ at a time when the pressure to sleep is high—for a few hours late in the afternoon or early in the evening following any rough night of sleep, per Schwartz’s recommendation—gives users repeated exposure to what it feels like to fall asleep and helps restore confidence, he says. Like ISR, SleepQ also enables 24-hour training for people who want to do it. Lie down and relax in bed, holding your iPhone in one hand. Every time the phone emits a tone, give it a slight shake. When the app no longer detects movement, it assumes you’re asleep. Then, the phone vibrates to wake you up. Next, you’re instructed to leave the bed for a few minutes. The phone will vibrate to let you know when to return to bed for the next sleep trial. You decide when to end each training session. 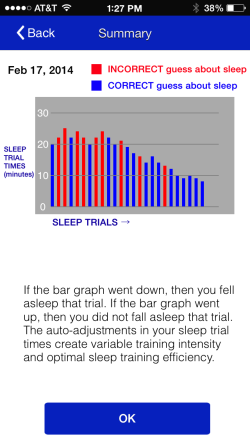 The screen then displays a graph with feedback about your sleep ability and your awareness of your sleep. 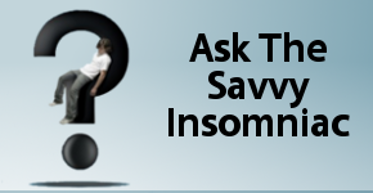 How effective is SleepQ at relieving insomnia? So far, Schwartz can cite only anecdotal testimonials from patients he’s helped. But if you’re open to experimenting, $4.99 is not a lot to lose. For more information about the app, visit the SleepQ website.